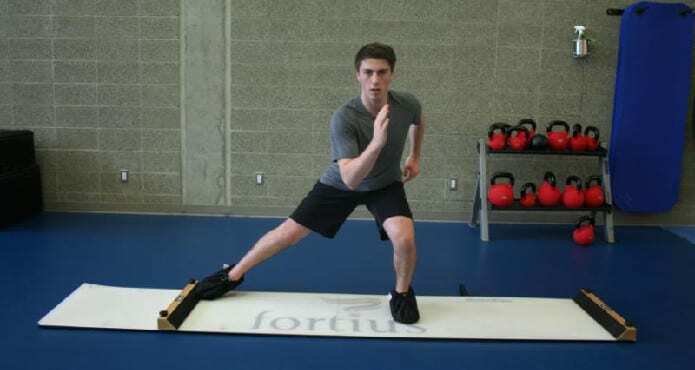 In this instalment Coach Adam Nugent-Hopkins (Lead of Fortius HockeySTRONG Program) provides an introduction to the Glide Platform Series, a sequence of movements that can easily be integrated into a dryland, practice, or game warm-up to reinforce proper hockey posturing. The Glide Platform Series can be performed with minimal equipment (in this video we utilize some rubber tubing, which can be purchased at any fitness supply store) and in minimal space. We have included several dynamic variations in this video, which challenge the athlete to demonstrate mobility, stability, and coordination through various patterns while maintaining an awareness of their Glide Platform. There are endless variations of movements that can be performed, however with hockey players we like to emphasize multi-planar hip mobility, thoracic or upper back mobility, and hip and core control. The Fortius HockeySTRONG program is the premier hockey strength and conditioning program in British Columbia. Led by Adam Nugent-Hopkins, our team of coaches at Fortius offer year-round elite and developmental training services. HockeySTRONG programs are based off of the Triphasic philosophy which focuses on lumbo-pelvic mobility, proper muscular activation and functional motion all needed to be a successful athlete in the sport of hockey.